On Saturdays during the summer, finding the fastest directions to the Outer Banks from the north can be challenging. The reason is the majority of our visitors stay in weekly rental homes and choose to begin (and end) their vacations on Saturdays. That means a lot of visitors, and workers, coming and going to the Outer Banks Saturdays between 9am and 6pm. 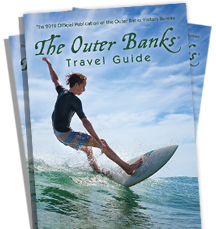 Check out a map of the Outer Banks before visiting. Discover the differences between our 6 towns and 7 villages that make up the beautiful chain of barrier islands. Here are some suggestions to avoid the traffic and get to the Outer Banks faster! 1. Consider starting your vacation on a day other than Saturday when driving to the Outer Banks. Many property management companies offer week stays that begin (and end) on Friday or Sunday. Coming and going on those days can mean at least 30% less traffic and a much faster, less stressful arrival/departure. 2. Consider an alternate route when driving to the Outer Banks. Particularly for visitors staying in OBX towns & villages south of Southern Shores (i.e. Kitty Hawk, Kill Devil Hills, Nags Head, Manteo, Rodanthe, Waves, Salvo, Avon, Buxton, Frisco and Hatteras Village), an alternate route can save several hours. Even if the route means more miles, you’ll be moving at a good speed instead of stuck in traffic. 3. Consider Visiting During Non-Peak Months. The open spaces and endless possibilities you love during the summer are pretty great year-round! Incredible events, smaller crowds and lower prices are a few reasons to think about coming to the OBX in fall, spring or winter. Not to mention, a whole lot less traffic.